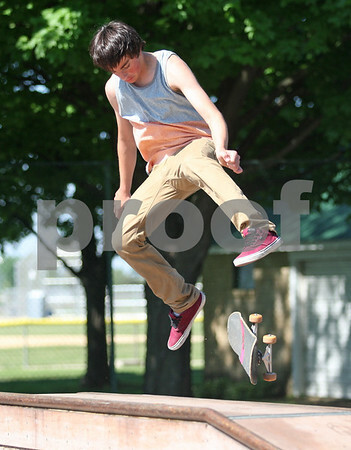 Vince Montalbano, 13, practices tricks at the skate park at Chamberlain Park on Thursday, May 29, 2014. Two public input meetings are scheduled in June regarding some improvements/changes to the park. Planned changes include moving/rebuilding the skate park, converting the existing skate park back to a tennis court and adding features such as a sand volleyball court, shuffle ball court, concrete baggo’s, horse shoe court and pickleball.